It's premiere night at the Palace Cinema! Illuminate the night sky with the spotlights as the child star arrives in a fancy black limousine! Gather the crowd on the star-studded sidewalk, then head into the detailed lobby with a concession stand and ticket area! Take the grand staircase into the theater with a large screen, movie projector and reclining chairs for six minifigures. 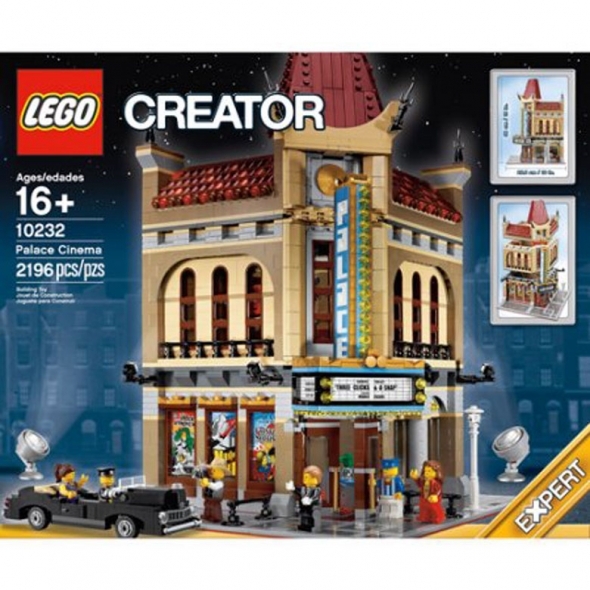 Introducing the Palace Cinema LEGO Creator Set, latest addition to the LEGO Modular Buildings series, a highly detailed, two-story Palace Cinema corner building. This collectible model/LEGO Play Set features a sidewalk of the stars, brick-built entrance doors, posters, sign frontage, a tower with spires and rooftop decorations. This kid's play set includes six minifigures: child actress, chauffeur, female guest, male guest, photographer and cinema worker.